He is a busy financial services profession and practically lives out his suitcase. He was leading a sedentary lifestyle with no workout or any fitness regime whatsoever. To add to this he would eat out more often than not. All put together it was a recipe for an unhealthy lifestyle. He needed to change that for himself. He decided to run the marathon which means it will automatically motivate him to run and do exercise every day. 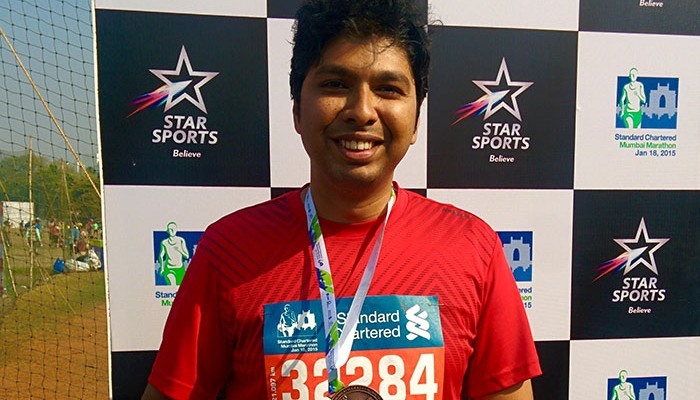 Let us hear it from Gawir Baig how he managed to shed his sedentary lifestyle and run a marathon. I work in the financial services sector and my job is hectic that involves lots of travel. I practically led a very sedentary lifestyle with no much workout or exercise regime and lots of eating out. Everything combined was getting me to be unhealthy. I decided I need to do something about this and decided to run the 2015 Mumbai half-marathon and even registered for it. My wife was aware of it. 3-4 months before the marathon she gifted me a GOQii fitness tracker to start preparing for the marathon using GOQii as a tool, as a catalyst which could help you in getting ready for the marathon. Technically I got a GOQii in October 2014 and ParwageAlam was my coach. The reason I was given the GOQii was to use this as a tool to start running and maintain the habit of running which could help me later to run 21 km half-marathon. I have run a bit in the past but because of my travel schedule, I was not regular. GOQii has helped me because I have a coach who monitors my activity, what I eat, what kind of diet I am following, the portions I am eating and whether I am drinking enough water or no. The tracker has helped in terms of getting into a rhythm of following a fixed pattern for running and exercise as well as the dietary part. It helps me in bringing some kind of discipline within me amidst all the madness around. When I am traveling and even otherwise I used to eat out often and followed a very unhealthy diet pattern. By having a GOQii coach this has reduced drastically. My coach then gave me a plan of how should I go about running for the next 4 weeks before the marathon. So maybe Monday 3 km then a break, Wednesday (3+2) km and so on. It was a pattern that helped me in terms of also increasing my stamina for running the marathon. I still consider the best part of this entire GOQii experience in terms of someone as a coach proved good to build up the stamina for the marathon. I run better now and hence still continuing to run. I run about 4-5 days a week. I have come to a stage where if I do not run I don’t feel good. I run about 5 km and cool down on 1 km and warm up of 1 km; so 7 km altogether. There have also been some habit changes brought in such not having a fruit after a meal. I have started having more proteins during lunch time. My lunch used to be completely carbohydrate driven now I include curds. I am not a vegetarian but my lunch is mostly vegetarian lunch so there is hardly any protein in that. Adding some curd is good protein. These dietary changes that I have brought about are helping me and I think the other thing which has really benefited me is having 5-6 meals a day. Small and frequent meals which I wasn’t having earlier. I used to have good breakfast, a good lunch, a good dinner and sometimes maybe an evening snack which was very unhealthy evening snack. Frequent meal intake is something which is brought to me and I am continuing to do that. On the sleep cycle, I wouldn’t say much because that’s correlated to the kind of work I do. I have to improve my sleep cycle. But, I am glad that on the dietary part and with regard to exercises GOQii has brought a good impact. My health goal when I started on GOQii was training for the marathon. At that time, I also weighed close to 100. There was an instance when I was about to do skydiving and the threshold for skydive was 100 kilos, it was mentioned over there although they were a bit fine even if it is above 1 or 2 kilos above 100. I was almost at that threshold. When I started preparing for the marathon, my weight reduced to about 92 kilos. Now my health goal is also to further reduce my weight by purely doing more activity and eating right. Over the next 18 months, I want to have a normal life and eventually bring down my weight to 82 kilos which are actually the right weight as per the BMI section. I am still at about 92. I am happy with my progress thus far. Now I really feel bad if I don’t run on a particular day. Frequent meal system is what has been inculcated in my dietary habits and that has resulted in the gradual weight loss. What does coach Parwage Alaam have to say about Gawir Baig? Gawir Baig is a guy with full determination. If he decides to do something – he will achieve it. When he joined GOQii he wanted to run Marathon, so I guided him with the proper schedule of running and following up with the practice session. He was really amazing – hardly miss his workout (running practice + Strengthening exercise). Then on the final day of Marathon, he completed his first half marathon within two and half hours. During his practice session, he challenged himself to run 10 KM in 68 Min on 23rd August, which was the qualifying run for Marathon and he prepared himself within 3 weeks despite his work schedules. Simultaneously he also followed all the tips in terms of diet pattern. He properly maintains his protein, carbs, vitamins intake and tries to have a balanced plate in every meal which has also helped him get lighter. This is a smart fitness tracker. It enhances my extra beauty. It is fashionable and smart fitness tracker. It has well pedometer for it, it tracks all activities. I use it in all functions as like Christmas day, marriage ceremony and birth day party. It has multi functions those are easily understand. Now it is my favorite fitness tracker. My smart fitness tracker ensures me call and alarm reminding. Fitness tracker has pedometer that helps me to count steps, km passing with calories burnt. I am really positively excited for the android supporting function. I can use this fitness tracker all time because it is secured from raining, showering.